This guide provides a step by step method of connecting the Google Nexus 7 Android tablet to the Raspberry PI using VNC. For this tutorial you will need a Raspberry PI running Raspbian Wheezy. (Read this guide which shows how to set up the Raspberry PI). You will also need a working internet connection on the Raspberry PI. (Read this guide which shows how to set up a wireless connection on the Raspberry PI). You will also need a Google Nexus 7 Tablet PC (Android 4.1 Jellybean) – 16 GB . If you booted into the Graphical Desktop double click the LXTerminal icon on the desktop. A message will appear asking whether you are sure you want to install the tightvncserver. Press y. A bunch of text will now scroll up the screen telling you what is being installed and how long there is to go. The first time you run the above command you will not have any settings saved so you will be asked for a password which the user must use to connect to the PI via the VNC. You will be asked to repeat the same password. Note that if you choose a password longer than 8 characters it is truncated. You will now be asked if you want to set a readonly password. If you do then select yes and enter a readonly password. A message will now appear stating that settings have been saved in /home/pi/.vnc. You now have a running server. So what did we actually do here? In steps 1 to 3 we booted the PI, connected to the internet and opened a terminal window. In step 7 I said we started the server but what does the command vncserver :1 -geometry 1200×720 -depth 16 -pixelformat rgb565 actually mean. The vncserver part is obviously starting the server. By default the vnc server starts running on port 5900. The :1 is the display number. What this means is that when you run the vnc client you need to specify port 5901. If you set the display number to :2 you would need to specify port 5902 and so on. The -geometry part of the command specifies the screen resolution to use within the client and the -depth specifies the colour depth. There are loads of VNC clients available on the Android platform but for this guide I have chosen AndroidVNC. It is free and it works. On the Google Nexus 7 open the Play Store. Click the search icon and type VNC Viewer. The first result should be android-vnc-viewer. Click the icon for this app. If you are connect wirelessly the IP address will be next to the wlan0 entry and will be something like 192.168.1.x (where x is the last number). Leave the nickname field blank. Enter the password you entered in step 8 of “Installing the server”. In the Address field enter the IP address from step 2. In the port number enter 5901. 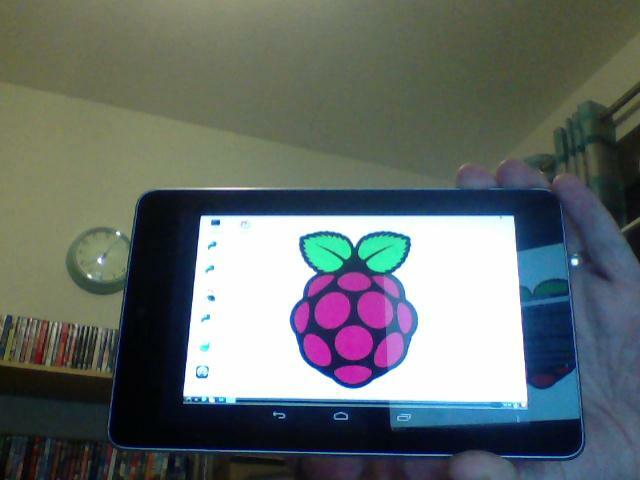 If everything has gone smoothly you should have a Google Nexus 7 connected to the Raspberry PI. I’m not sure running the VNC server when booting is a good idea by the way. If you are never going to use your Raspberry PI with a monitor then I guess there is a case for starting the VNC server every time you boot but if you generally use your Raspberry PI with a monitor but occasionally plan to use another device to connect to the PI then I would use SSH to connect to the PI and start the VNC server from within the SSH session. Read the next section to see how to do this. Open a terminal window by clicking the LXTerminal icon on the desktop. If there are errors when you run the command in step 6 check that you have the same commands as in step 3 above. If there are no errors try and connect to the Raspberry PI using your Google Nexus. The final test is to reboot your Raspberry PI and then attempt to connect to the Google Nexus. So what did we do in this section? In step 1 we opened a terminal window. In step 2 we opened a text file called vncserver which is a shell script that will start when the Raspberry PI starts. In step 3 we created the script that is run. In step 5 we turned it into a service that starts at boot up. In steps 6 and 7 we test the server by starting it manually. In step 9 we try connecting to it. Now the script may look complicated but essentially it is building the same tightvncserver command used in the first section. If you specify start when running the script as in step 6 then the tightvncserver command will run. If you specify stop when running the script then the server will stop. If you specify restart when running the script the server will stop and then start. The default option is to start. I’m not that keen on running the VNC server every time I start up the PI. I think it is better to make the decision to start it when you want to. If you followed the section to start the VNC server every time then first of all you will need to reverse step 5. The problem now is that to be able to VNC onto the Raspberry PI you need to be able to start the server. The problem with that is that you need to be on the PI to do that. I recommend therefore installing an SSH client onto your Google Nexus 7. The client I chose was called “Connectbot”. Click the icon for this app. Your VNC server should have started again and you can run AndroidVNC to connect to it again. You should now be able to use your Raspberry PI without having to use a HDMI cable connected to a monitor or television. In theory you can now plug it in anywhere in the house as long as you have a wireless signal to the router. You can use most of these instructions for connecting to the Raspberry PI from any computer. You just need to have a VNC Viewer on the client computer and an SSH client. Everyday Linux User Review of Crunchbang Linux #! Thankyou for letting me know. I have fixed it now. Thanks a lot for this! Exactly what I was looking for, you saved me a lot of time. Worked just as described. Ok so I use a Nexus 7 (KitKat) to connect to my Raspberry Pi so those two variables are the same. The difference is therefore either the operating system on your PI or the model. Are you using model B? Which operating system have you got on the PI? I am using Raspbian and I am using the latest build of Raspbian. Just trying to work out what the differences are between your setup and mine at the moment. From your description, things 'appear' to be identical. Maybe I'm expecting too much of the setup, I had expected it to function similarly to a second monitor under windows? I've checked and rechecked the code to makes sure I copied it correctly. I'm completely new to Raspbian and the Raspberry Pi. Any help would be appreciated. I've been able VNC in on my ASUS tablet following the manual methods using the command below. vncserver :1 -geometry 1200×720 -depth 16 -pixelformat rgb565. I must admit that this was one of the very useful and informative posts I have read this year thanks Gary!!! Good news for those who want to try it with other devices such as Iphones or Ipads, because this is also possible !!! its exactly the same procedure as Gary has described it above except the only difference would be to download/use (VCN Viewer) on your device and it will work 100%. I have tried this as I was trying to control spi communication on one of my electronics rigs used for aviation.